A great & relative cheap way to add a "retail ready" finish to your garments is with swing tags. These often contain additional branding or information about your products that you cannot fit onto a neck print or will get discarded as a separate flyer / insert. Alongside producing these for you we can also attach them for an small additional cost. Have a look at our relabelling page for more info on this service. Our most popular & most cost effective swing tags are our premium silk tags, printed on smooth, sustainable 350gsm card. Our most popular sizes are A8 (74mm x 52mm) & A7 (104mm x 74mm), although other sizes are available. You can also have "luggage" shaped tags for no extra cost. All tags are made with a 5mm hole for attachment, just place this where you want on your artwork. We offer tag attachment & can polybag your garments too for a professional retail finish. Minimum order for tags starts at 100 (although we recommend getting 250 for best price breaks), & we can hold remaining stock for future orders. For more info, or for a competitive quote get in touch. We also offer glossy tags for the same cost as silk. These tags are also printed on 350gsm sustainable card, but have a shiny finish. Our most popular sizes are A8 (74mm x 52mm) & A7 (104mm x 74mm), although other sizes are available. You can also have "luggage" shaped tags for no extra cost. All tags are made with a 5mm hole for attachment, just place this where you want on your artwork. We offer tag attachment & can polybag your garments too for a professional retail finish. Minimum order for tags starts at 100 (although we recommend getting 250 for best price breaks), & we can hold remaining stock for future orders. For more info, or for a competitive quote get in touch. 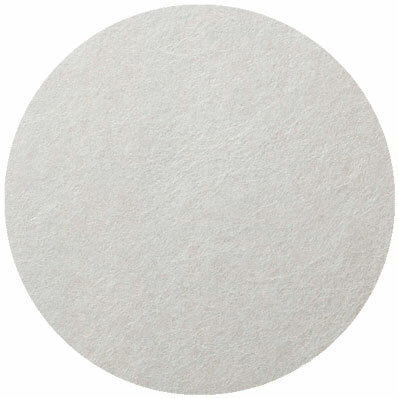 Pulp swing tags have a subtle texture from the sustainable sourced pulp stock. The card is 380mic thick & has a matte finish. Our most popular sizes are A8 (74mm x 52mm) & A7 (104mm x 74mm), although other sizes are available. You can also have "luggage" shaped tags for no extra cost. All tags are made with a 5mm hole for attachment, just place this where you want on your artwork. We offer tag attachment & can polybag your garments too for a professional retail finish. Minimum order for tags starts at 100 (although we recommend getting 250 for best price breaks), & we can hold remaining stock for future orders. For more info, or for a competitive quote get in touch. 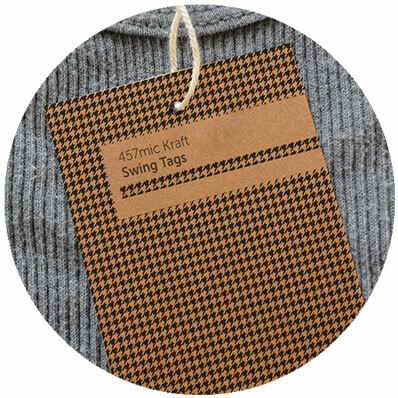 Kraft swing tags are made from 100% recycled, 457mic stock, & a have a natural appearance. The white parts in your design will the colour of the card, so bare this in mind when designing your tag. We recommend keeping it simple for best results. Our most popular sizes are A8 (74mm x 52mm) & A7 (104mm x 74mm), although other sizes are available. You can also have "luggage" shaped tags for no extra cost. All tags are made with a 5mm hole for attachment, just place this where you want on your artwork. We offer tag attachment & can polybag your garments too for a professional retail finish. Minimum order for tags starts at 100 (although we recommend getting 250 for best price breaks), & we can hold remaining stock for future orders. For more info, or for a competitive quote get in touch. If you're after a really sturdy tag, then we recommend triple layer tags. At a hefty 810gsm these are super durable. The tags are available with or without a contrast strip in the middle (available in 12 colours) & have a silk finish. Our most popular sizes are A8 (74mm x 52mm) & A7 (104mm x 74mm), although other sizes are available. You can also have "luggage" shaped tags for no extra cost. All tags are made with a 5mm hole for attachment, just place this where you want on your artwork. We offer tag attachment & can polybag your garments too for a professional retail finish. Minimum order for tags starts at 100 (although we recommend getting 250 for best price breaks), & we can hold remaining stock for future orders. For more info, or for a competitive quote get in touch.